Have you ever thought about walking The Way of St. James? Nowadays, there are many active tourism agencies offering organized trips, but still many pilgrims prefer to do it on their own. Later, we will explain the advantages and disadvantages of both options. ORGANISED TRIP OR TRAVELLING ON YOUR OWN? Are you thinking about walking The Way of St. James? From “Camino de Santiago Reservas” we encourage you to walk the way, a great choice in your life which will lead to a wonderful experience. Many walkers, before starting the way on one of the different routes, ask themselves, how can I do it? Can I do it on my own (planning the route, accommodation, dates…)? Or should I take an organized trip (through an active tourism and free time activities agency)? That is a question to think about, so we want to show you the advantages and disadvantages of each choice. - The organized Way of St. James is one of the models many are choosing nowadays because some people could not have this great experience otherwise; other people see this as another option regarding the evolution and development of time management and the itinerary to walk. - Some agencies offer the possibility of choosing a date to do the trip, but others have their own departure and arrival dates. - At night time, you will have your own room with private bathroom in many cases, where a well-deserved rest is guaranteed. - Many services also include companion, guide, support vehicle and direct contact with the agency, where they will help you with your needs as soon as possible, give advice about which route you should choose, give information about the places you will visit… This will suppose great saving especially regarding to time. - It also involves a great, unique and unforgettable experience which encourages many people to try the different routes year after year. - Even though you can walk the way as you want, some Tourism Agencies that organize this kind of activities already have established dates, accommodation and places to visit which may not fit your preferences. - The achievement of an objective in your life, which will contribute to enrich your human strength, enthusiasm and self-esteem. - You can choose your start date. - You could also pick the places to stay. - For those who like to organize their trips and routs in an independent way, this is the perfect choice. - As everything in life, doing this route by foot or any other means of transport on your own entails some risks. - If you don’t have travel insurance, you are taking the risk on any accident and you will have to face it personally. 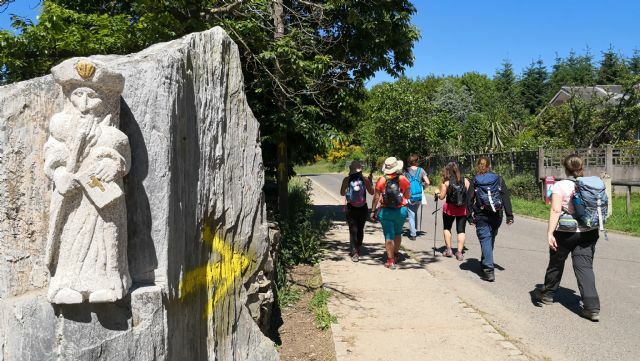 - During the route you could have any personal need, like making phone calls, checking the condition of the path, the weather…, and you will have to take care of those problems on your own. - You will have to book personally the accommodations where you need to spend the night (hostels, inns, hotels, rural houses…), with the issue of overbooking or the fact that a place may not fit your needs. - Rest. There are many accommodations where you will have to share a room with other travelers, with all the problems that may cause for your well-deserved rest after walking for such a long time. - Personal Hygiene. There are also many places where you can easily book but they might be overcrowded and you will have to share bathroom and showers. This doesn’t mean the accommodation is in bad conditions, just that you need to be aware you are going to share it with other people. - You will have to carry all your luggage, personal belongings, backpack… This is one of the biggest challenges of walking the way on your own and it involves a great effort, strength and resilience; you need to be physically ready to resist it in routes of 20 to 100 km long, by foot or by bike. - Well, it is a great adventure which normally goes fine, but there are those risks involving more time and personal effort.